Today Bennachie is a place of leisure, shared with forestry, where we can walk, run and enjoy views of the surrounding countryside whilst glimpsing the local wildlife. Bennachie has a rich and varied history. It was an abundant source of resources for the area nearby; it has witnessed battles, held fortifications, inspired myths and legends and has, for a time, been home to the Bennachie Colonists. Most of what we believe about the lives of the early inhabitants of the area has been deduced from clues in the landscape, the most obvious being the great monuments such as standing stones, circles and cairns. Soil evaluation can show where early farmers might have settled and pollen analysis of the peat can indicate human influences in the vegetation over the millennia. Here is some of the fascinating history of Bennachie. You can learn more from this website and the publications on sale in the online shop. The Bennachie Landscapes Group continues to study and research the hill; we are learning more all the time and welcome new members to help us unwrap Bennachie’s past. Around four hundred million years ago, molten rock from far below the surface was pushed up (intruded) under the surface sandstone and slowly cooled. Over millions of years, wind and rain etched and eroded the rock and during the last million years, glaciation from the ice ages carved the landscape, leaving the iconic shape of Bennachie that we know today, with its granite tors and moorland top. The glaciation left a surrounding area blessed with fertile soil, albeit well scattered with rocks, which hampered cultivation but provided material to build homes, fortifications, mystical stone circles and standing stones. Stone tools from surrounding fields show that Mesolithic hunter gatherers travelled nearby. Study of these artefacts allows us to imagine how people lived and the style of tool helps to date the find. This understanding is constantly changing as new discoveries are made. When temperatures rose, the last ice receded, leaving a bare landscape. Gradually, trees and other vegetation became re-established, creating a habitat for animals who may have migrated from Doggerland. This environment made the area attractive to nomadic hunter gatherers, who may also have travelled from Doggerland. Stone tools found at Milltimber and Nethermills on Deeside have been dated between 14,000 B.C. and 10,000 B.C. (Late Upper Palaeolithic). Around 4,000 B.C. the adoption of new technologies heralded the Neolithic Age. Cultivation of crops and domestication of animals began, pottery and stone axes appeared, as did burial of the dead in the long and round cairns. Large oak built halls have been dated to this period and their purpose is keenly debated, perhaps these had a ceremonial purpose or may have been communal dwellings. Whatever their purpose, nearby pits and finds on the sites have confirmed repeated, if not continuous, settlement. It is thought that the Neolithic farmers were partly nomadic, moving to new sites when soil became exhausted. Recumbent stone circles, such as the one at East Aquhorthies, which include a horizontal stone flanked by two uprights, are a familiar feature of the North-east landscape and surround Bennachie. Most are built around cremation cairns and burial sites and may have been funerary, but could also have been used as calendars, astronomical reckoners or ceremonial sites. Their construction would have needed significant effort and coordination. Current estimates place building at the end of the Neolithic, and beginning of Bronze Age. Remains of buildings, found so far from the Bronze Age tend to be more widely spread than those of the Neolithic. They also reflect a change from rectilinear to circular building styles. The round houses at Woodend of Braco are attributed sometime within the Bronze to Early Iron Age. These dwellings have not been excavated; crop marks indicate they could be ring ditch houses but excavation could provide more precise dating and better definition of the structures. Crop marks at Tullymuick have indicated a possible enclosed settlement of around fifty round houses. Recent LiDAR (Light Detection and Ranging) aerial photography has pointed towards hut circles in other locations on the hill. Woodend of Braco also features a Bronze Age round cairn. Picti (Painted People) was a name given to some of the troublesome tribes of northern Scotland by the Romans around 300 A.D. The Picts have left behind place names and the enigmatic carved stones portraying strange beasts, mystical symbols and seemingly everyday objects such as combs and mirrors. It has been suggested that the name Bennachie came from Benne Cé meaning the mountain of the people of Cé, an area named after the king Cé, a son of the mythical founder of Pictland. Mither Tap hill fort is one of the most striking monuments in the area, its massive stone ramparts are visible from many miles away and may have been built to display the power of a major Pictish magnate. Carbon dating of charcoal from inside the structure has confirmed habitation during the fifth and the eighth centuries. Recent excavations at Rhynie have suggested this area traded with the Eastern Mediterranean, and that Rhynie was a major power centre between the fifth and ninth centuries. Christianity is thought to have begun spreading into north east Scotland from around 600 A.D. 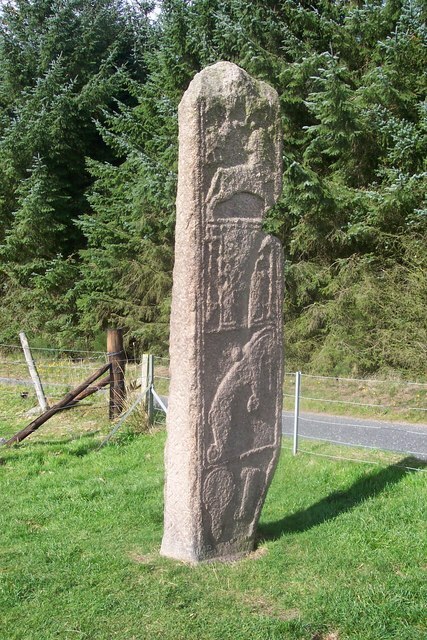 The emergence of stones combining Christian and traditional Pictish symbolism around the seventh to eighth centuries, seems to show Christianity’s increasing influence and possible co-existence with Pagan beliefs. One of the earliest churches in the area is thought to be the chapel of St Finan, on the north side of the Don, belonging to the Culdee Monastery of Monymusk from 1210. Originally called Eglismenythok, the P-Celtic egles (church) would date its founding to before 800 A.D. Many historians believe the site of the Battle of Mons Graupius, fought between the Roman army and Caledonians led by Calgacus in 83 A.D., took place between Bennachie and Durno, the site of a large Roman camp. No evidence of a battle site has been found yet but this is not unusual for Roman battle sites. The Battle of Harlaw was fought in 1411 between the forces of Donald, Lord of the Isles and Alexander, Earl of Mar, supported by the provost and baillies of Aberdeen. Many men were lost on both sides, the local men went to sleep after a day of hard fighting and as dawn broke, awoke to find the remaining Highlanders had slipped away. The Middle Ages were turbulent times, when nobles were rewarded for loyalty to the Crown through grants of land and could, equally, lose their land if they displeased the monarch. 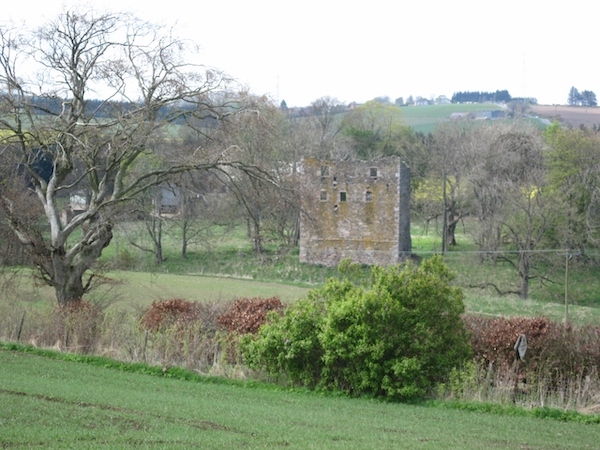 Many castles such as Harthill, Pitfichie and Balquhain were built, some on the sites of even older ones. These castles witnessed nobles feuding with each other and loyalties divided over Mary Queen of Scots, civil wars in the 1640’s and Jacobite Rebellions of ’15 and ’45. Originally built for defence, they later became stately homes, baronial mansions flaunting their owner’s Renaissance credentials, before falling into ruin and many, such as Harthill, Pitfichie, Tillycairn and Leslie have been restored. During the Middle Ages the barons had responsibility for meting out “justice” in their lands, as evidenced by the number of Gallows Hills still showing on maps. Scotland had no standing Scottish army right up until the Union of 1603, therefore in times of war the nobles and their men (tenants) were expected to muster for battle. There have been two aircraft crashes on Bennachie. 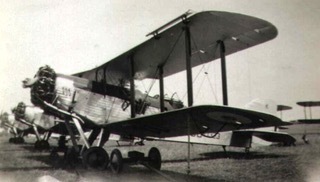 The first on 3rd September 1939, the first day of World War II, was an RAF Westland Wallace biplane flying from RAF Wigtown to RAF Evanton (Easter Ross). It crashed into Bruntwood Tap in fog. The pilot, Pilot Officer Ellard Cummings (23) from Canada and the gunner Leading Aircraftman Ronald Stewart (24) from Paisley both died and are officially recognised as the first military casualties of the War. An RAF Gloster Meteor jet on a low level training flight from Leuchars in Fife crashed on Oxen Craig on 12th February 1952 in a snowstorm. The only crew member Pilot Officer Brian Lightfoot (22) from Yorkshire was killed instantly when the plane exploded on impact, scattering wreckage over a wide area. One of its 4 cannons can be seen suspended in the meeting room at the Bennachie Centre. We would ask that people do not remove or disturb any remaining wreckage on the hill but leave it as a memorial to these brave young men. A memorial plaque, commissioned by the Bailies of Bennachie has been built into a cairn on the south side of Oxen Craig to commemorate them. Please also see our Projects for more information on both past and present work.